The potato has its genome sequenced. The first draft covers 95 per cent of the tubers genes. The completed sequence would be 840 million base pairs, about a quarter of the human genome. The sequence allows breeders to locate genes for any type of trait. This should improve yield, quality, disease resistance and nutritional value, said scientists from 14 countries. Teams around the world are working on genome sequences for other plants in potatos family, Solanaceae, which includes tomato, eggplant, petunia, tobacco, and pepper (sequence available at http//potatog-enome.net). So far, it was believed Alzheimers caused poor sleep.A new study found it true the other way round as well. 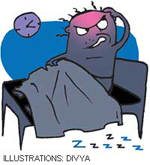 The result is a vicious cyclelack of sleep leading to Alzheimers and the disease causing more sleep loss. The scientists found mice that didnt get enough sleep for three weeks had more plaques (deposition of protein between nerve cells), typical of Alzheimers, in their brains than mice that had slept. They associated this with the levels of protein in Alzheimers. Studies in humans havent shown a link between Alzheimers and sleep loss, but lack of sleep, particularly in mid-life when the plaques begin to form, could hasten the onset of the disease in genetically susceptible individuals (Science, September 24). A recurring warm water current along the equator in the Pacific Ocean, El Nio, affects weather in the tropics. There are two of them. One is on the rise in central Pacific. The second, in the eastern Pacific, increases wind sheer in the Atlantic and does not allow major hurricanes to form there. But with global warming, the central Pacific El Nio could minimize the beneficial impact of its eastern Pacific counterpart and worsen drought conditions in Australia and India. Researchers have found that over 20 years, the frequency of an El Nio in the central Pacific has increased from one of every five to half of all El Nio occurrences (Nature, September 24). Diamonds have a new tag they could be a patients best friend. The gems might be the ultimate mri probe because they are sensitive to magnetic fields. Physicists lodged a nitrogen atom in a diamond crystal and found it could sense atomic scale variations in magnetism at room temperature. Most other such devices for magnetic sensing must be cooled to nearly absolute zero to operate, making it difficult to place them near live tissue (Science, September 10). Trichloropropane, a synthetic chemical used as an industrial solvent, can stay in soil and groundwater for over 100 years. An enzyme can degrade such chemicals. Researchers genetically modified an enzyme to change its properties. This helped degrade trichloropropane 32 times faster than usual. Improving properties of enzymes also has potential application in medicine, chemical and food industries (Nature Chemical Biology, August 23). Insects detect chemical signals, pheromones, to find each other and their hosts. The chemical gets into the antennae of the insect and attaches to a protein called odorant binding protein, which guides the insect further. The new find is other compounds also bind to the protein much more strongly than pheromone. The compounds could be also used to block insects to detect chemical signals and control pests. This would be first tested on aphids (Chemical Communication, September 24). Antibiotic resistance has been a problem for doctors. A new antibiotic developed might target drug-resistant bacteria differently. 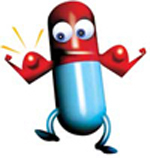 Existing antibiotics destroy bacteria by blocking production of its cell wall, dna or protein. The new compound, MAC13243, is directed at blocking a particular step in the development of the bacterias cell surface. This might help develop interventions for resistant infections (Nature Chemical Biology, September 27).